Arslocii is not about sniping. It is about finding positive experiences and connections, and attempting to point out the best examples. In this case, though, in looking for a meaningful experience at Grounds for Sculpture, we feel compelled to include a disclaimer of sorts, or maybe a preamble. Feeling as if, possibly, I could be missing the point, I have been to visit the park three times: once soon after it opened, a second time about ten years after and again last week. My feelings are unchanged, and I have to say that the whole affair is a sad reflection on New Jersey’s significant sculptors, many of them represented in the park. Okay, you could argue that it is important to have a venue like this but, honestly, it doesn’t do justice to the art that it is supposed to serve, and it sadly mixes up the uneven quality of its holdings to a point (a cluttered one, no less) where the whole becomes homogenized and average. 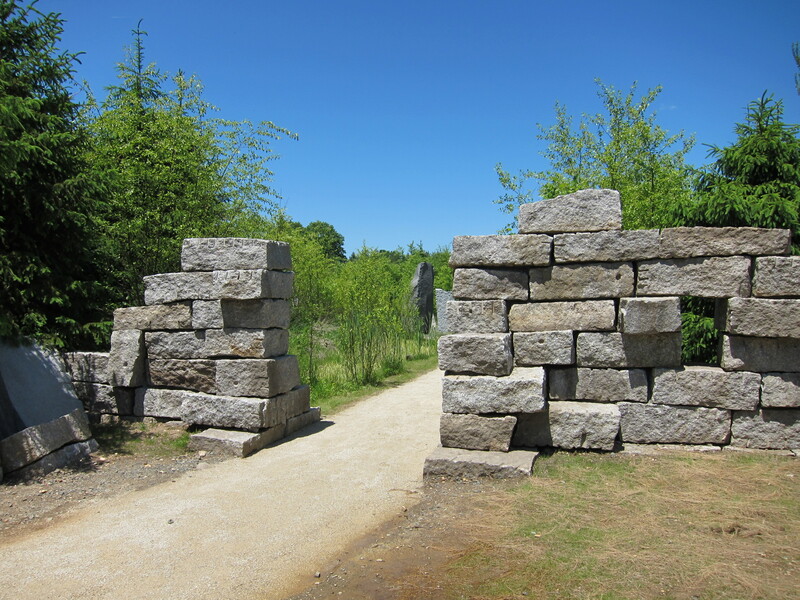 Yes, it has a lot of sculpture – more than 250 pieces; yes, it has landscaped grounds, in a rather suburban-style arrangement, and although there are artworks of merit in the broad collection they, generally speaking, are scattered about the grounds as decorative objects with no thought as to their sites beyond a pedestal mentality. In an attempt to create display areas, there has been much mounding and shaping of the grounds – which I must assume were originally pretty flat, it being south-central New Jersey. But now it is all very phony and gumdroppy strolling through a terrain that, at times, resembles upturned breasts, artwork frantically suckling for some sort of unavailable nutritional source. Let’s just say, upfront, that the preservation and reuse of the site – a former state fairgrounds – was commendable; the land dates back for that purpose to 1888 and was the site of agricultural exhibitions, stunt shows and daredevilry, including a shooting match between Annie Oakly and Miles Johnson. Many of the extant buildings were constructed from the 1920s to the 1940s and they are architecture worth saving. The fairs occurred on these grounds for nearly a hundred years, and then the area was slated for development and went up for auction. The fact that the Johnson Atelier – a bronze-casting foundry used by many artists, including its namesake – saw the value of the land is fortunate, and not only to extend the life of a piece of New Jersey history but also to make the site viable, which it is. But this blog is focused on finding placeness, and sometimes, even in the most unexpected situations, it can happen. Unfortunately, here it has nothing to do with the artwork, and not even most of the gardens. 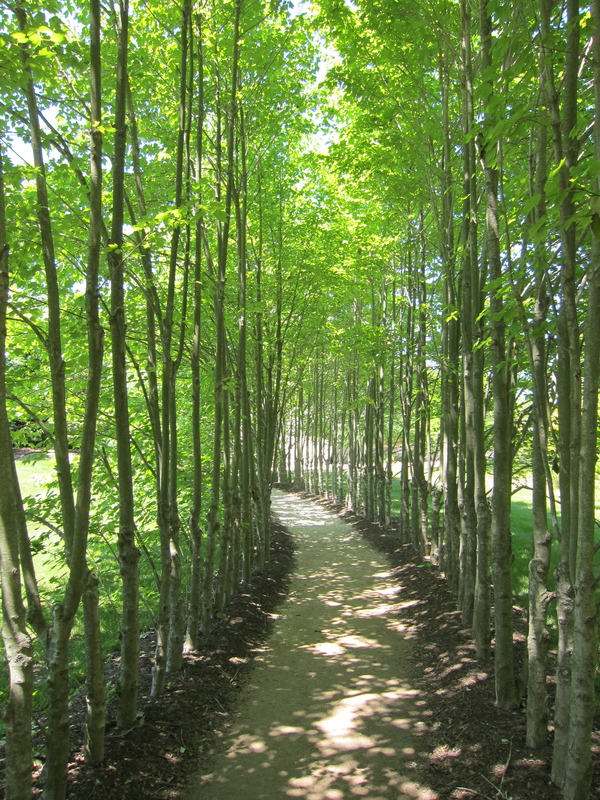 The best thing that this park achieves is the transitional spaces: the paths made of steel grids and gravel; the maple allee – a narrow curving walkway with densely planted trees, more an alley than an allee; two stone tunnels that connect gardens but feel like tomb entrances; a wisteria arbor that is like another more garden-y tunnel; a rock cliff as a dolmen entry; and, nearby, a stone-walled portal reminiscent of a Mycenaean tholos. All these passageways have what most of the sited and designed areas they connect do not: a feeling of place, a unique connection between the obviously manmade component and its setting. Interestingly, they are feeders to what are supposed to be the main events, but they have more life in them than the destinations do, as if more thought went into them than did the selection and placement of the sculptures. And, too, there is another larger space that works to good effect – again, not because of the art. 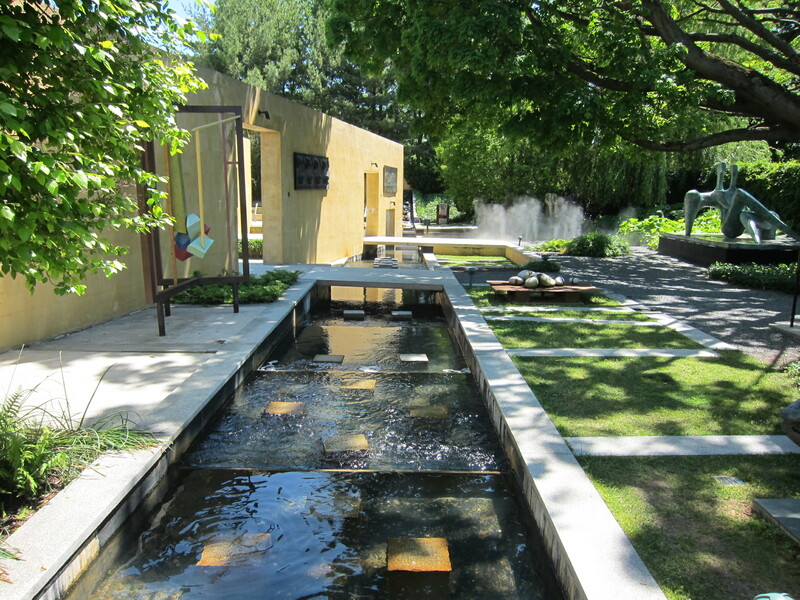 The Water Garden, a tad over the top but still compelling, is a walled courtyard, a group of interconnected rooms that all have water in common. Attached to the Domestic Arts Building, this enclosed and hard-surfaced garden gives the courtyard garden in Jacques Tati’s “Mon Oncle” a run for its modernist money. Extremely geometric with high walls, there are changing elevations, some rooms are open while others are more hidden, window cut-outs both high and low allow glimpses into other rooms, water moves through and around it all. There is just about every kind of water feature one could imagine, some still, some flowing: pools, fountains, rivulets and runnels, steam, bubblers, waterfalls, rain. Although there is complexity in its puzzle-like spatial flow (if you look up, it could feel like you are in a rodent maze), there is a strong sense of place – something rare in the park at large. 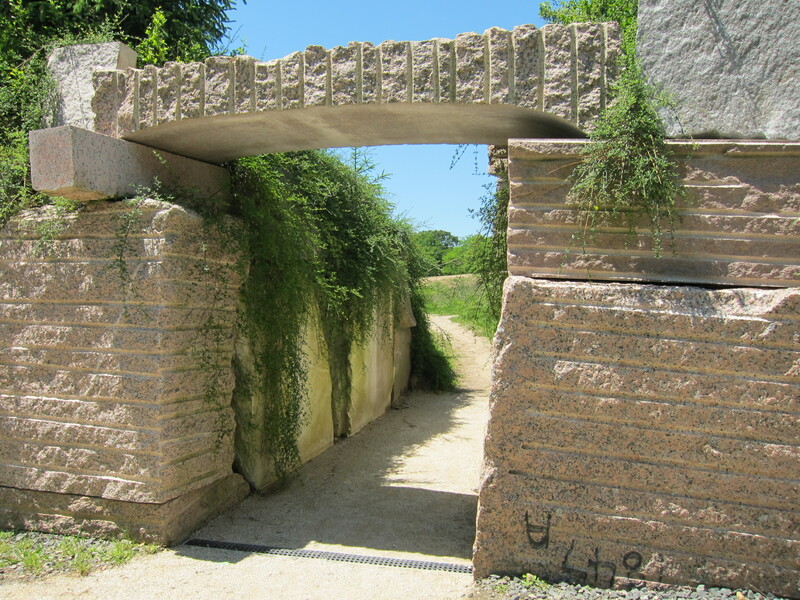 There are references here to Persian gardens, cloister gardens and, too, the Hirshhorn Sculpture Garden. Of course, it is not the Hirshhorn, in its design or in its collection. But there is a thereness to it. On the edge of kitsch or even the stuff of malls, this courtyard manages in its use of space to find itself, to find us in it, and to make our experience special, something beyond the fray. It is, after all, what we seek. And it can be found. Even here. Gardens, no matter their size or consequence, create a sense of place. 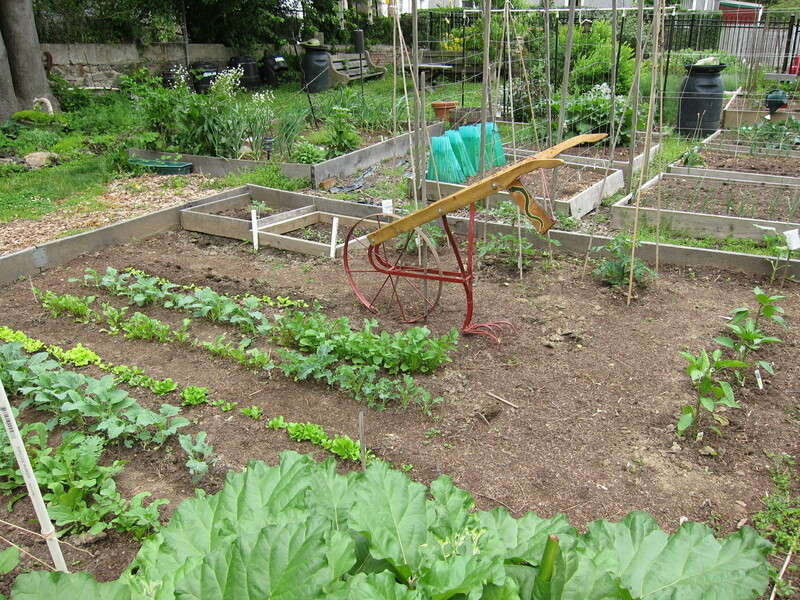 Just the act of establishing a garden is one of place-making, stake-claiming and root-setting. And although most gardens are made up of pretty much the same elements, the arrangement of those elements is what makes each one unique. 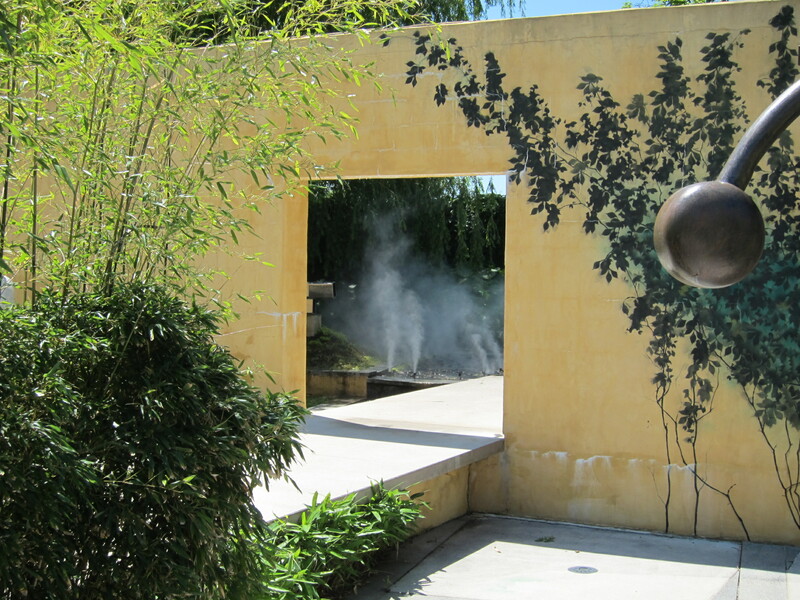 Then, going beyond unique, there are gardens with an eye for something special – making placeness out of a place. For us urbanites, finding enough land and available sunlight in a concrete-covered environment is not easy. Thankfully, community gardens – like the one we’re members of, just up the block – have appeared, rising from the dead on weed-filled, unwanted, unusable or simply unused and abandoned dumping grounds. A remarkable thing is how forgiving abused land and nature can be, given half a chance. A community garden already has a sense of place as reclamation, it having been rescued from a state of neglect and nurtured into one of care and reuse. 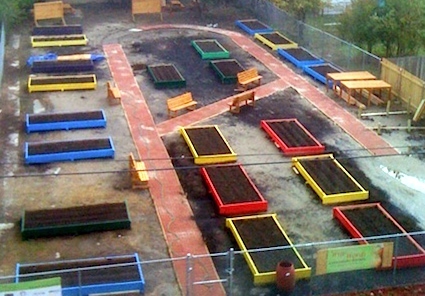 Usually fenced, giving it the status of a place apart, the community garden has an arrangement of spaces – rectangles for planting beds and aisles for moving through and around. (Not unlike a cemetery, really, but for quite the opposite purpose.) 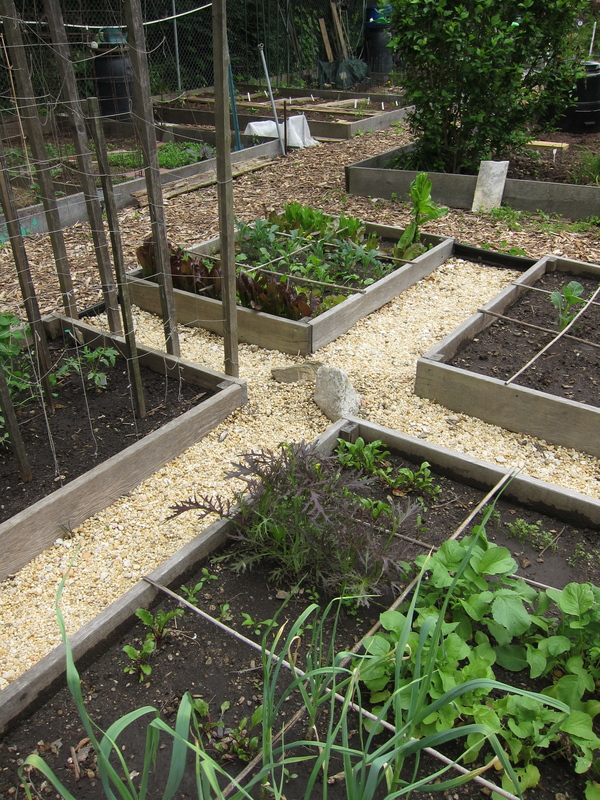 Skillfully designed and laid out examples of community gardens have a more meaningful use of space and flow; others can be a bit helter-skelter with no plan to guide them. The same could be said about the individual plots. A community garden is representative of its community: a diverse group of backgrounds and approaches all coming together in like-mindedness for interaction with nature’s forces and for mutual support. Each gardener in our community effort has her/his own method: some plant like a traditional farm, in long rows within the parameters of the plot; others apply a grid for a square-foot approach – divvying up the precious small area into even smaller portions; while still others have an innate sense of color and texture and ways of arranging and pairing the plants in a decorative way. Some people feel a need to populate their patch with elfin figures, frog statues and ceramic mushrooms, creating a bizarre scene among the shin-high foliage. And, as in “The Three Little Pigs,” a few build more permanent structures for their climbing foodstuffs, while others take their chances with prefab, mass-produced, easily replaceable temporary cages that could be susceptible to some huffing and puffing. It is the human interaction with nature that creates the initial sense of place. Taking a rigidly defined parcel – a functional allotment of relatively flat ground with no distinguishing features, a subdivision of preceding subdivisions (similar to tract housing parcels on a smaller scale) – and making it have a real presence is a willful act by a human hand to work with and enhance the setting beyond its functional requirements: creating a place of sustenance for the body and soul. But, within the greater garden, certain rare gardens can project a sense of place all their own, an added dimension of place within place – the surprise inside the Cracker Jack box, unnecessary but totally welcome – a bonus. We have found a few that qualify. 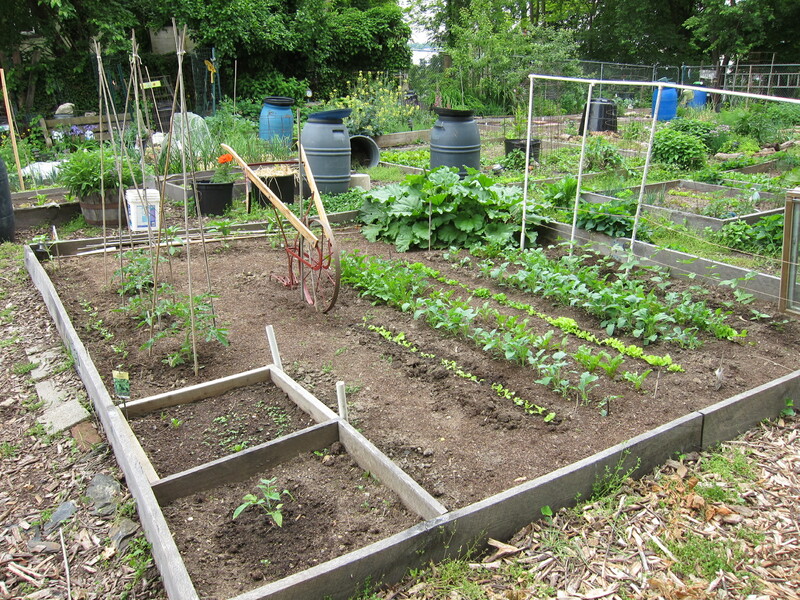 One effort of note in our community garden is simple, straightforward and effective. The mini farm: A larger than average plot that lends itself well to its design motif, it has a focal point of an antique manual tiller (the before), long furrows of planted fields (the after), cold frames, simple bamboo tripod supports – it is a microcosm of a real farm, a place of food production, and a bit of theater. That someone would build a world inside another world, like nesting eggs, emphasizing the placeness of an already unique site, is laudatory. It is the exception for individual food gardens, albeit personalized or decorated, to rise above form as function and create place. 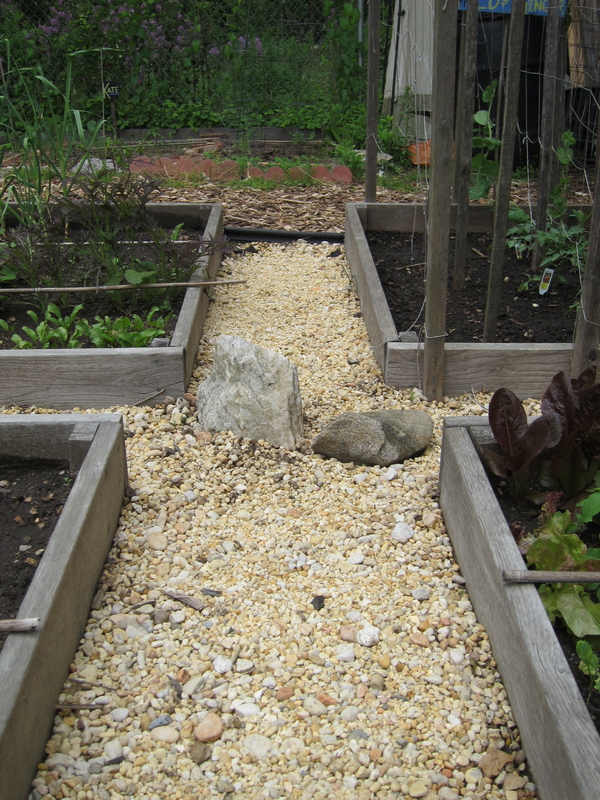 A second example: Another simple garden within the larger one has an Asian theme, four squares of orderly, gridded, raised beds divided by bamboo poles, its paths made of gravel with nods to mountainous landscape. Again, a world, a place defined beyond practical need. 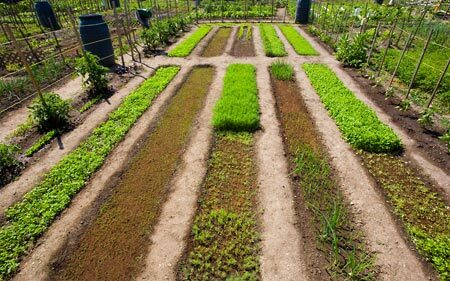 Although all gardens stimulate the senses, the food garden is the most sensible of gardens – especially now with industrialized food production trying to remove us from our essential connection with our most basic need. 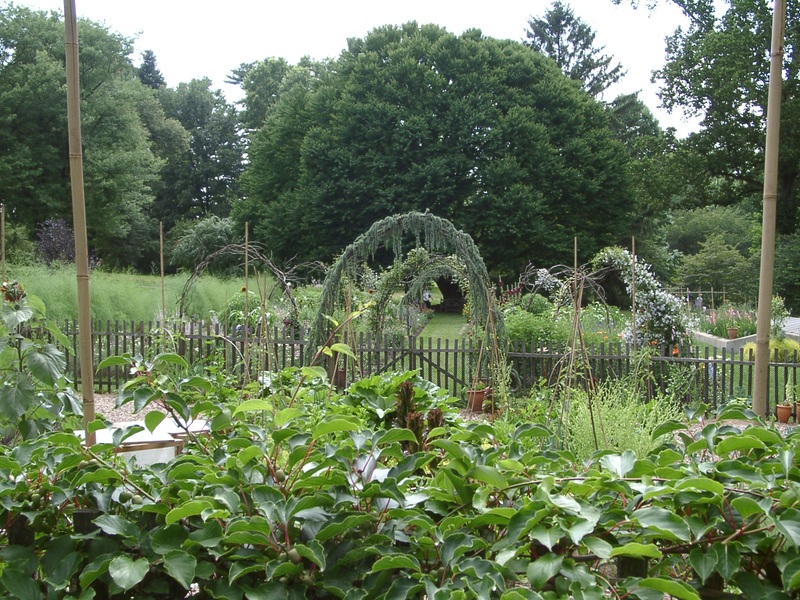 One of the most integrated food gardens we have ever seen is at Chanticleer, a former estate, now public gardens just outside Philadelphia, in Wayne, Pa. Touted as a pleasure garden, it is a textural and visually stimulating array of gardens, mostly decorative and consciously artistic and largely successful. 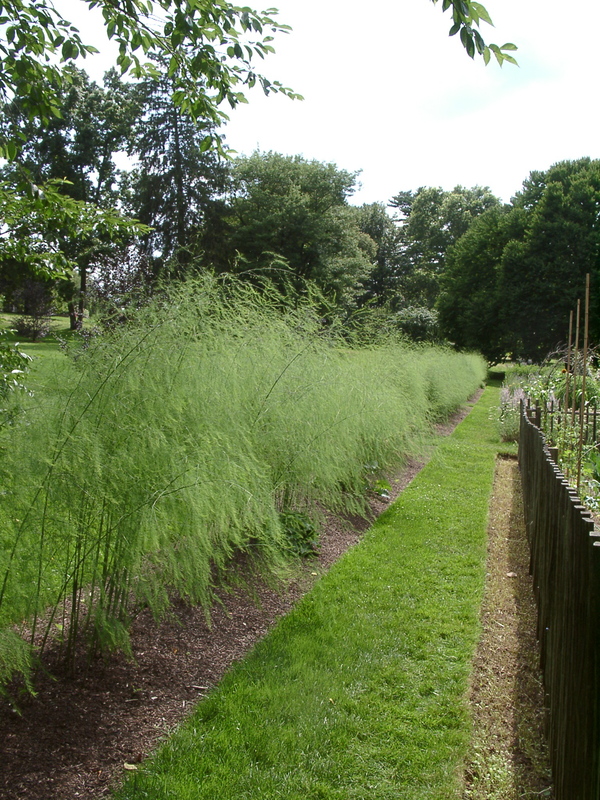 But its greatest success is the “veg-edible garden,” its function and form intrinsically merged: the clever uses of food plants like asparagus for a long perimeter wall, trellised tomatoes climbing on and becoming the surrounding fences, espaliered pears creating a geometric screen, plant supports fabricated of simple bamboo, transitional arches graceful and ceremonial. The materials are mostly natural and are used in ways that remove the garden from the merely functional into the artful, making you want to spend time there. The care and design do not make the food grown there taste any better; however, you do devour it with your eyes. It is its own expression and shared interaction with nature – the stuff of true nourishment. Both the literal and figurative definition of garden is one of life and source, a place of creation or cultivation and sustenance. It is even suggested as the answer to all of society’s ills in Voltaire’s Candide, as a respite from world upheavals and the only place where one can find contentment and, if not control, at least a semblance of being on an equal footing with destiny. Two hundred sixty years later, it still makes sense out of nonsense. Our search here is for inventive food gardens that set up a dialogue with nature, a thank you for the bounty, an offering to the partnership, a kind of shrine to garden-ness, a place to be and grow. Arslocii. 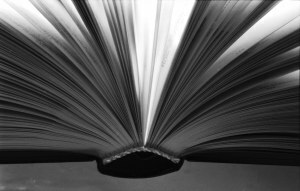 Could there be anything, anywhere with more placeness, and artfulness, than a book? In the small amount of space that a book takes up in our hands and in front of our eyes there are worlds. It is both its own place and any place. And its placeness is multifold: It is not just those well-described universes created by writers and laid down in ink on a page – the intended placeness – but also those spinning galaxies of life and motivations that we invent in our own minds, that we bring to the reading experience from our own histories and backgrounds, in partnership with and reaction to those dark, squiggly symbols that are words and that we interpret into mental pictures. It is this self-imagined world – in which we can conjure up and “see” people we’ve never met, and buildings and towns we’ve never visited, even creatures and things that do not exist – that is at the heart of the magical placeness of the book. But there is another, book-related placeness that, perhaps, is the most powerful, and personal, and evocative of all. Let’s digress, momentarily – in order to make a soon-to-be-made point – to a discussion of the new iPad. It, like so many of the Jonathan Ive/ Steve Jobs/ Apple mechanisms, created not just a curiosity in us, or a mere desire, but a lust. (Or, rather, it has done so in one of us … the male one of us.) And not the least of which because of its ebook-reading capabilities. 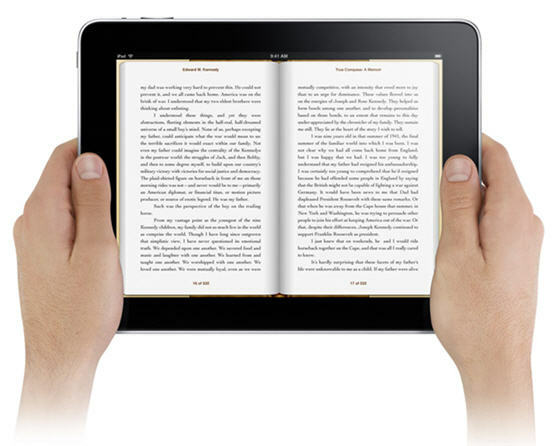 The iPad’s screen is bright and clear and can, in an instant, “become” any book, any word-built world, any brain we desire to see or meet or, like avatars, live in. And to bridge the gap between what we have had for centuries and what it offers, the iPad produces a brilliant simulacrum of the old-media reading experience. Turn the seductive, handheld device sideways, in landscape orientation (an appropriate descriptor for the viewing of worlds), and the screen “becomes” a book, with the familiarity of facing pages. What’s more, with just a horizontal swipe of a finger across the smooth glass screen, one can “turn a page,” the astonishing software emulating the comforting rhythm and flow we of all older generations have come to define as book reading. You can sit, and read, and flick pages, in a hammock, at a table, even under the covers, with a book that brings along its own flashlight. It has everything a book has … except essential placeness. That is, it itself lacks so much of what makes a place a place, and a book a book. The slide of a finger across frictionless glass does not have the scratch, the catch, the warm roughness and stubbly caress of paper’s subtle resistance. One cannot slip one’s finger under a page and hold it there, in sweet anticipation of feverishly flipping it over to follow a tense story line. The iPad pages have no smell. They do not bend. They cannot tear. They will not age. It is not easy to jot down that “NO!” or “YES! !” next to a passage that inflames you or defines you, and you cannot discern the personal affront or happy agreement felt by the person or persons who read the book before you, because we cannot see their particular handwriting and underlining, confident or tentative, in pencil or ink, that tells us that real people have touched this page and been touched by it, and that now we are part of that continuum, that shared reading journey. In fact, with the iPad, there is no sense, no evidence, no mark indicating that anyone has read this before you: all books are new and hold no spiritual or physical residue of those who lived and read before us. In the physical and, perhaps, metaphysical sense, a book is like a plot of land; an ebook is like the deed to it – with it you can find the land, and know it, but never feel the soil sift through your fingers. All this, and more, about the iPad (and other similar electronic devices) we’re sure has been written. But when it comes to true placeness in the book-reading experience, where the real art lies – the art of the physical book, the vehicle per se, not the words or pictures on the page – we may find no better symbol of the difference between old and new than in the lowly, literally overlooked gutter. 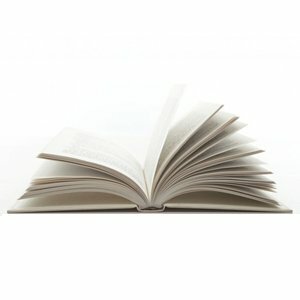 Indeed, of all the components of a book – cover, page, words, illustrations – the most unduplicatable component outside the physical realm is the gutter: that gap, that valley between facing pages, the gully that swoops down to the binding, that chasm of process that allows a book to be a book. It is by the gutter that we can gauge our reading progress (as the sage said, to measure what we’ve lost). It is in the gutter where we slide our bookmark or slip in that ribbon that carries with it the memories of other gutters and others times, and of the circumstances that brought that ribbon into our lives. In the gutter of second-hand books and library books, we find the evidence, the detritus of others, and in our own books read again we bump into our own leavings: a hair with a color of bygone times or long-gone people, crumbs from the meal or snack we had in our first life with the book, receipts we thought we’d misplaced or thrown out – in that little chasm, that caesura, dwell so many of the wonders of reading and of being a reader. If living is an art, then the gutter of a book – inimitable in an iPad, ebook world – is a strange, unexpected locus of the art of intellectual life. 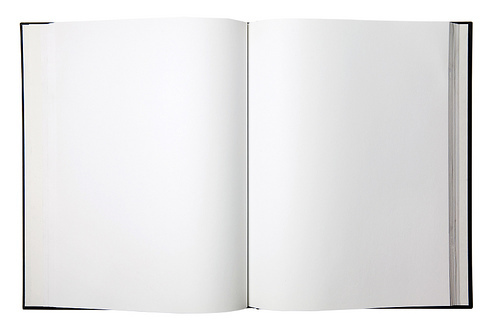 A book is more than just viewable words, organized. It is a place where we take things from and put things in, and leave ourselves in some way. It is like speech, in that it is the spaces between that can make all the difference. In the rush to “progress,” we are so worried about being left behind, of falling through the cracks. Sometimes, the cracks are where it’s at. Railroad tracks have always had a sense of place for me. Although they are merely conduits, arteries, circuitry used to move something along and through and away to the next destination, they are compelling objects in their own right, and especially so when you come upon them on foot – surprising discoveries in unexpected places. I must not be alone in this feeling that tracks lend a placeness to wherever they are, because so many people, even in places where the tracks have been removed, gravitate there to walk, ride their bicycles and feel good being outside. Asphalt possesses little of the poetry of tracks, but the spatial construct, the feel of it, is extant and recognizable. 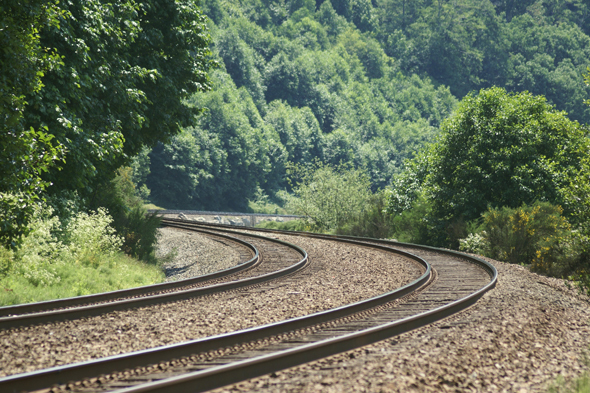 For a hundred years or more, railroad companies laid their tracks alongside waterways, following the natural connectors of land to create settlements, commerce and expansion. In fact, many rail lines had the best views along the riparian edges of rivers and coastlines, as well as some dizzying, breathtaking, winding switchback climbs up to seemingly impenetrable mountains, which they then penetrated and came out the other side. 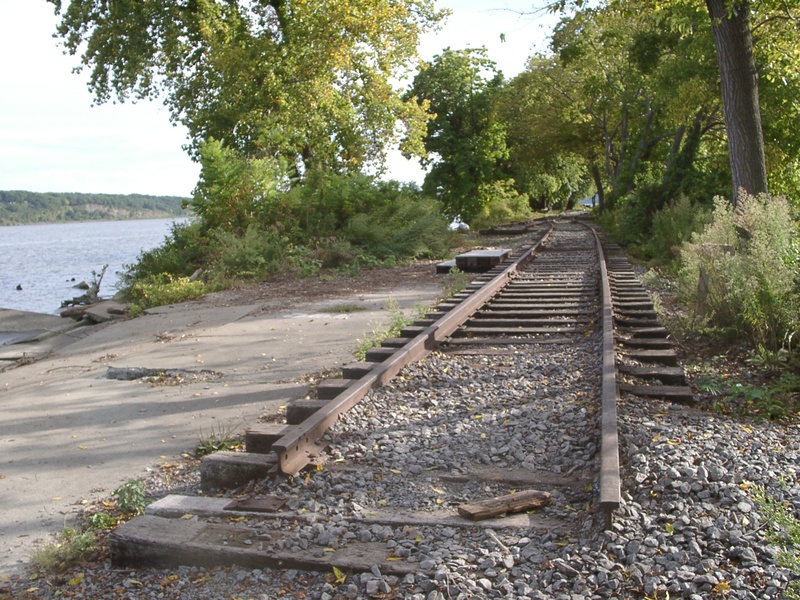 The rail paths’ existence alone is a marvel to ponder, along with the human power that built them, but one must also consider the isolation and loneliness that surely accompanied the laying of track in places that only dreams – of manifest destiny, of wealth, of monumental achievement, of nature-taming – could imagine. Sometimes, today, the rail tracks look like scars on the land, zipper scars, that reveal the invasive alteration of the earth’s skin: trees were felled; rock was cut; ground was leveled; cinders and gravel replaced rich humus; dead, prostrate, creosote-soaked wood replaced upright living wood; stakes were driven – man’s needs reigned supreme. Over the years, since that initial scarring, nature has reasserted itself and, in the most wonderful of spots, it and the hand of man have achieved parity. 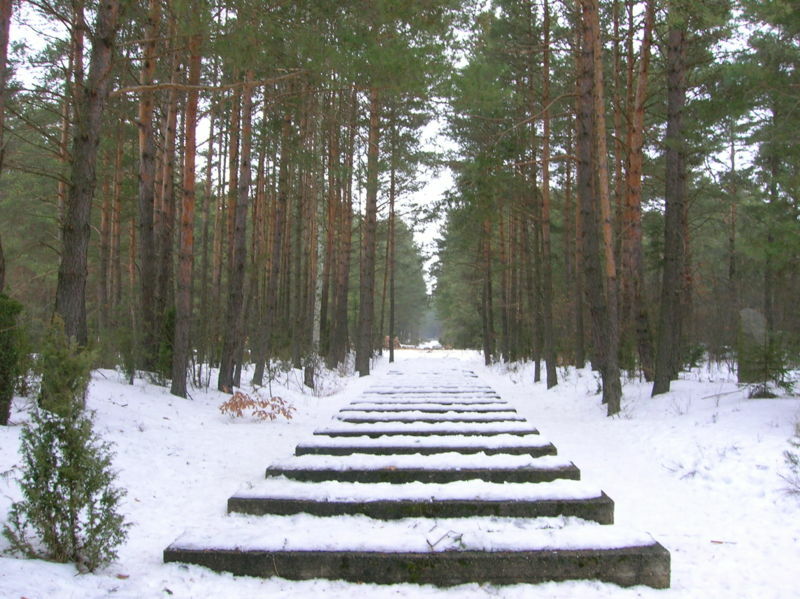 There is a combined effect that happens between train and nature, forming a kind of tunnel or arbor out of the feral growth that occurs around the brutal tracks. It grows in a kind of carved-out topiary with generational memory of the last passing train – the plant life accommodating or dying, fashioning an elongated green arcade, a verdant chute with lovely dappled light. This half-human/half-nature creation is a horizontal rabbit hole, beckoning us Alices to enter it. Such is the effect of the encasing foliage structure above and around the tracks, which either go straight ahead for miles, fading into perspectival distance, or turn and disappear, suddenly, like animal tracks: both scenarios lend their own mystery. It is a teasing of the mind’s eye, a stimulation of the imagination as to where it goes and how far and where it leads, conceptual issues that add to the magic of the already magical enclosed space – all at once, and in one, a sense of destiny and placeness. My great grandmother’s house sat on the floodplain between the river and the tracks, with not much ground separating the fixed from the moving. The tracks were an upper boundary, running atop a banked retaining wall along the property, a bizarre inside-out moat that had to be crossed via a gravel road for access to the world. There was an interesting irony, one I didn’t grasp at the time, of being settled, stationary between two modes of transportation. I was drawn to the tracks, as if by a magnet, not only for their mysterious presence but also by a metaphor I didn’t yet understand: standing at a crossroads, looking both ways to where the tracks had been and where they were headed, disappearing into uncertainty. All these thoughts arise when I look at railroad tracks: a combination of memory, imagined journey, markers, pointers, industrial achievement, conquest and the reassertion of nature’s mandate – resulting in a powerful sense of belonging. One more thought, full of memory: For me, as a child visiting Coney Island in Cincinnati, there was a ride that generated this same sensation: the Kiddie Kars. 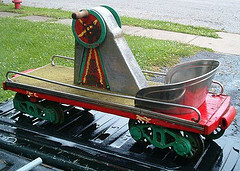 Comprised of small-gauge tracks, and on them miniature hand-cranked railcars (think of a full-sized handcar or pump trolley, but designed for one – a tiny one), it was somebody’s idea of utilizing, for fun and profit, the dead space behind and under the big wooden roller coaster. It was a child-powered adventure around and beneath the big ride but through the same sort of back-alley thickets, wrong-side-of-the-tracks magical mystery tour that real trains traveled. And it was wonderful in conveying a sense of unexplored lands and self-sufficiency, freedom and even danger – the remote but ever-present possibility of something falling from the heights of the roller coaster – exactly the sort of things that kids love and that liability laws and parental overprotection have made extinct these days. Back then, it was all about kids relying on their little arms to propel them out of the overgrowth and the otherness at civilization’s edge, the abandoned-seeming and forgotten rear of the park, and, at their own pace, returning to their waiting parents. It was always the most fun when there was no one behind you to make you go faster than you wished to go. With this ride, being last in line was best.